The Loft Station cabin bed is an ideal solution for a busy teenagers retreat or a younger childs play den. 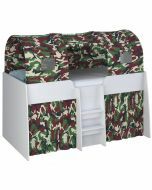 It can be supplied with a fitted desk and bookcase or a camouflaged or pink tent and curtains. The ladders are centrally placed so the bed can go any way round and utilise space within any size room. 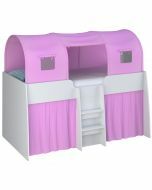 The Loft Station cabin bed is an ideal solution for a busy teenagers retreat or a younger childs play den. It can be supplied with a fitted desk and bookcase or a camouflaged or pink tent and curtains. The ladders are centrally placed so the bed can go any way round and utilise space within any size room. A clean white finish with thicker edges for sustained durability. Comes flat packed for easy home assembly. Bed Dimensions H.98 x W.110 x D.195cm.